Someone asked me at PEX where this solution came from all of a sudden, well this is based on a solution I came up with on a random Friday morning half of December when I woke up at 05:00 in Palo Alto still jet-lagged. 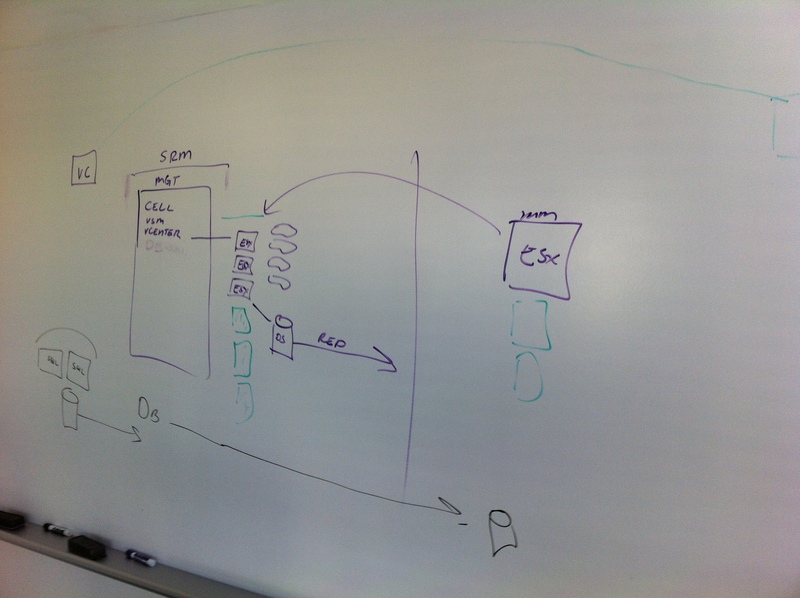 I diagrammed it on a napkin and started scribbling things down in Evernote. I explained the concept to Chris over breakfast and that is how it started. Over the last two months Chris (+ his team) and I validated the solution and this is the outcome. I want to thank Chris and team for their hard work and dedication. After Duncan’s story ends, it actually continues with Chris and myself. I was already at VMware HQ working, when I received a frantic call from Chris, who repeatedly told me to “find a white board! find a white board! quickly find a white board! I am on my way in!!”. I found an office with a white board as instructed, and the photo shown below is the result of this white board session, in which Chris drew for me Duncan’s now infamous napkin diagram. It is just a shame that the napkin is no longer with us. I still have the napkin, it’s a little green now though. Sorry about that.